West Coast wilderness awaits you at East Sooke Regional Park. Experience it as you hike along the windswept rocky coast, over dry hilltops, through dark rain forest to sheltered coves. 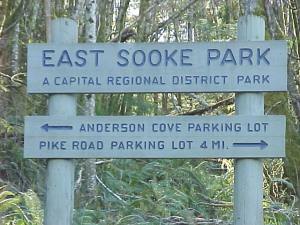 East Sooke is the largest CRD Park, encompassing 1422 hectares ( 3512 acres) of natural and protected coastal landscape. In this Wilderness Recreation Park, youll experience solitude and harmony with nature in a par untouched by urban progress. Ayland Farm is popular with picnickers, and those looking for easy excursions. A 5 minute walk through open fields leads to a pocket beach where you can discover intertidal life, or watch River Otters scurrying across the sand. Trails head inland to hilltop views, or along the rugged Coast Trail. Anderson Cove, on the Sooke Basin, is the starting point for hikers heading to Babbington Hill, and Mount Maguire. On these hilltops, Bald Eagles, and Red-tailed Hawks join you for sweeping views of the Olympic Peninsula. 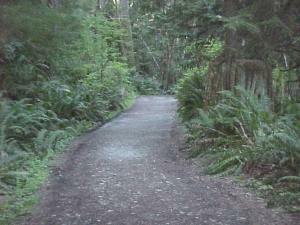 Pike Road is the most westerly access to the park, and to the Coast Trail. An old logging road winds through forest to meadow and beach. Here, at low tide, look for Periwinkles, Goose Neck Barnacles, and Purple Sea Stars. East Sookes Coast trail is considered one of the premier day hikes in Canada, a west coast wilderness experience within easy reach of the city. The 10 kilometer trail is rough and winding, a challenging 6 hour trip even for experienced hikers. One moment you travel across a bluff of windswept pines, the ocean crashing at you feet. Next you enter a dark rainforest at the end of a ravine. Turn a corner and youre back in sunlight, at the edge of the sea. Feel the presence of the Coast Salish people at Alldridge Point, designated as a Provincial Heritage Site in 1927. Here youll see petroglyphs bruised into the rock, a style particular to the Strait of Juan de Fuca. Near the end of the Coast Trail is Creyke Point, a rocky headland of unusual shapes against emerald green water. Your hike ends at Aylard Farm. A heritage apple orchard is all that remains of the last settlement. Where livestock once grazed, meadows are now sweet with Clover, Wild Rose, and Blue-eyed Grass. At dusk, Columbian Black-tailed Deer wander in from the surrounding forest to feed. East Sooke boasts an active past. Coast Salish people ( the TSou-kes ) reef- netted salmon around Becher Bay, and collected shellfish, berries, and roots for winter months spent at Pedder Bay. Spanish explorer Manuel Quimper first entered Sooke Inlet in 1790, but within five years all lands north of the Strait of Juan de Fuca became British. Three years later, Vancouver Island was granted to the Hudson Bay Company, under the direction of its chief factor James Douglas. The late 1800's were busy years in East Sooke: large sailing ships and dugout canoes ran supplies to and from Fort Victoria, and a steam powered sawmill provided lumber for the small community. Within what is now East Sooke Regional Park, loggers, miners, and fishers sought their fortune. In the heart of the park, loggers selectively harvested trees. Stumps 2 - 3 meters ( 6-9 feet) in diameter hold clues to the era of the springboard, axe, and crosscut saw. At Iron Mine Bay and Mount Maguire, copper and iron were mined on and off for nearly 100 years. The quality and amount of ore, however, were limited, and never led to significant commercial success. Fishers reaped the riches bounty. From early Autumn , fish traps were secured in the sea bed. The trap shack at Cabin Point is solitary witness to those days. East Sooke Regional Park is located on the East Sooke Peninsula, 35 kilometers west of Victoria. 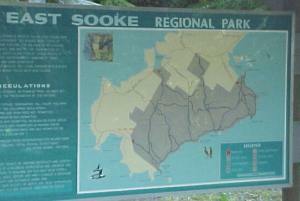 To reach the park, take the Old Island Highway (#1A) to Sooke Road. Follow Sooke Road (#7) to Happy Valley Road, turn left and continue down Happy Valley. Turn right on Rocky Point Road, which becomes East Sooke Road, and leads to park entrances at Aylard Farm, Anderson Cove, and Pike Road. Allow approximately 60 minutes driving time from downtown Victoria. CRD Parks belong to you. Park regulations exist so residents and visitors will always be able to enjoy and appreciate protected natural landscapes. Regulations are posted at par kiosks or are available from CRD Parks headquarters. East Sooke is one of the most spectacular parks in the region, attracting those looking for challenging hikes in a wilderness setting. This attraction can also be a danger. The mystical pull of East Sooke - Sharp cliffs wrapped in mist, crashing waves, sudden tides- are all natural hazards, especially if youre unprepared. If lost stay calm, make yourself visible and stay where you are until help arrives. From mid September to late October, Turkey Vultures and Red-tailed Hawks, Peregrine Falcon, Merlin, American Kestrel, Cooper's Hawk, Sharp-shinned Hawk, Northern Harrier, Osprey, and Bald Eagle gather in East Sooke Park on the Southern tip of Vancouver Island; a staging area for south bound migrants which stop over here before crossing the 18+ miles of the open ocean of Juan de Fuca Strait on their way to Olympic National Park, Washington. Peak migration is at the end of September. Directions: Follow the Beechy Head trail from the Aylard Farm, East Sooke Park Entrance. Stay to the left for about a 20 min walk on the trail until you see an unmarked path on the right that leads forward and up to rock bluff lookout. Follow this very short path, climb the rock - you are there.